In bowl combine butter, ½ C sugar, vanilla, flour, 3 tbs of cocoa, baking powder, ½ teaspoon salt and milk & blend. Add nuts. In 1½ qt baking dish combine remaining sugar, cocoa & salt and 1⅔ cups boiling water. Drop batter by tb. onto boiling mixture. Bake at 350° about 45 min. Sprinkle with confectioners sugar. Serve with whipped cream if desired. Coming tomorrow night: The first of two recipes featuring peanut butter! 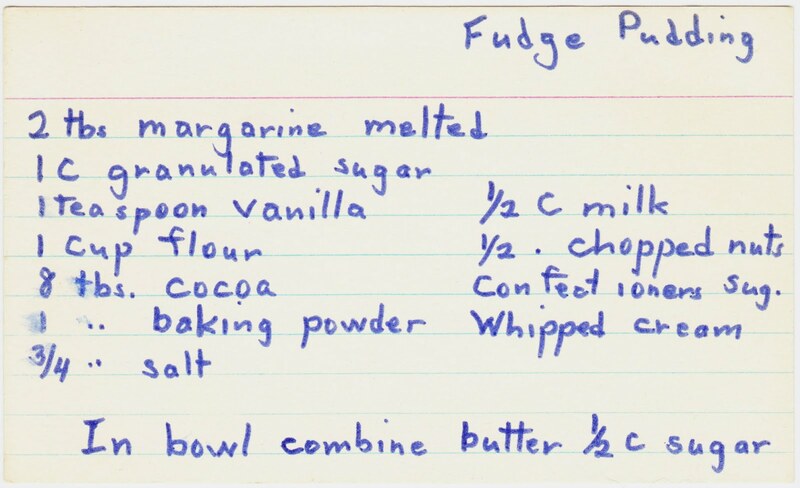 How can this be a beloved recipe? There isn't a drop of chocolate on it! Only a cruel cook could have such a clean recipe card ... one who didn't let anyone lick the spoon then get sticky fingerprints on the card. Or else, the cook was rushed to the hospital with third degree burns after standing too close as s/he dropped balls of sugar into a boiling mixture, and the recipe card was filed away with things not to do again.